RN, BSN, LPN, CNA… There are many pathways to nursing, each varying slightly in training, responsibilities, and of course, pay. To get a closer look into the field of nursing, I researched the levels of nursing hierarchy and interviewed six current nurses about their backgrounds, jobs, and what they see for the future of nursing. 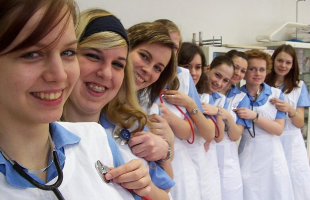 So you want to be a nurse? First, identify where to start and what your end goal is. Maybe a CNA is the right step for now, while you work to become an RN later. While not all of these are strictly “nursing,” they all play a role in the healthcare hierarchy. What do you think the future of nursing looks like? Need CNA training? From October 1-8, get a great deal here! Want to know more about nursing in 2013? Check out our infographic! What do you think about the future of nursing? Tell us in the comments!